The Perdomo 20th Anniversary Robusto Sun-Grown cigar is a semi box-pressed Nicaraguan puro presented in elegant Spanish cedar boxes. Hand crafted at the Perdomo Factory in Nicaragua, these premiums have a superb flavor profile. The Perdomo 20th Anniversary Robusto Sun-Grown cigar is a semi box-pressed Nicaraguan puro presented in elegant Spanish cedar boxes. Hand crafted at the Perdomo Factory in Nicaragua, these premiums have a superb flavor profile. A result of a terrific blend of all Cuban seed Nicaraguan wrapper, binder and filler leaves carefully selected as the best of the best tobacco from each of their Nicaraguan farms. The Sun-Grown wrappers have been aged a minimum of 6 years, and are then aged an additional 14 months in bourbon oak barels. 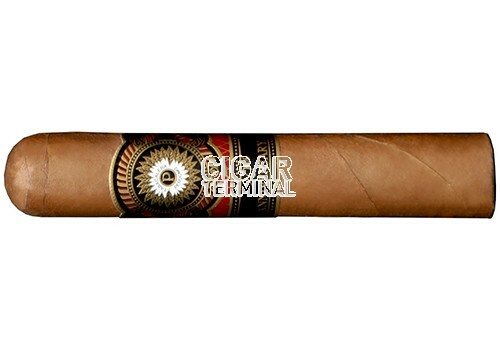 The result is a level of complexity that is arguably Perdomo's best cigar to date.